John Rogers of Denham Springs was a tank company commander during WWII. Originally from Indiana, he was teaching in Wisconsin when he was drafted following the United States’ entry into WWII. He served with the 2nd Armored Division during WWII in France where the division played an important role in the liberation of France, Belgium, and the Netherlands and the invasion of Germany. John, now age 96 and an amputee due to diabetes, volunteers regularly at the WWII Museum in New Orleans. This is his story as he told it one recent Saturday afternoon, with a few editor’s notes added in brackets. 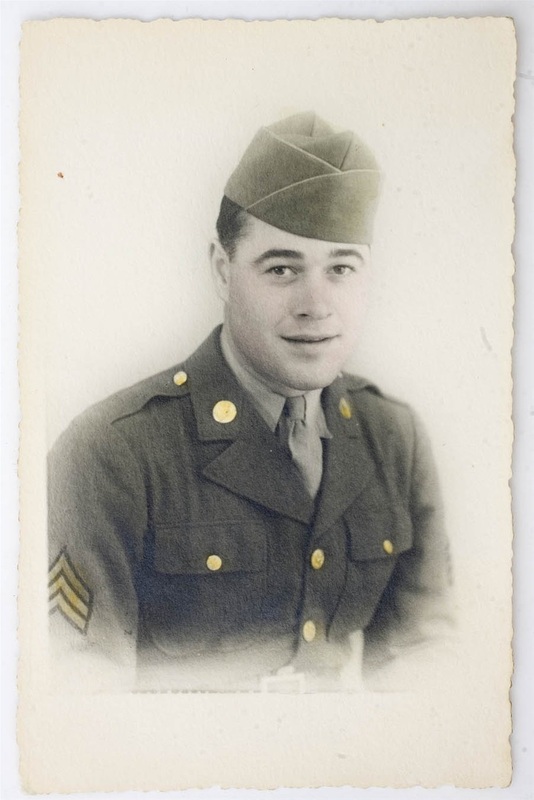 Part 1: “I went through basic training for the 4th Armored Division in Pine Camp, New York,” said John Rogers. “My company commander suggested I apply for officer’s school but I said, ‘No, I just want to do my job and go home.’ But lo and behold, one day I got orders to go to officers’ school in Fort Knox Ky., so I went, of course. There were 100 in the class, and 60 of us graduated. “Upon graduation I was sent to Camp Polk. Louisiana, where they were creating the 11th Armored Division there at the time. I was there a little over a year. We learned a lot in maneuvers down the main highways of Louisiana and all over the Fort Polk area. The main thing was keeping your cool and making a split-second decision, reacting to a situation, and not dilly dallying. Right or wrong, you made the call. John Rogers served as a Sherman tank commander during WWII in Europe and fought in many of the fiercest battles in France and Belgium. Rogers is shown here standing second from left with a group of fellow Army Reserve soldiers shortly after WWII. “In 1942, we were sent out in the desert in California for more maneuvers, and from there we went to England where we waited. We knew D-Day was getting close because more and more aircraft and tanks were coming in. When D-Day arrived, the sky was full of airplanes and helicopters. I got orders to report to the 2nd Armored Division in France around D-Day+8, after the landing at Normandy. I was assigned to company E, and that’s where I stayed the rest of the war, first as a platoon leader and later as company commander. On April12-13, the City of Walker will turn back the clock to 1944 for the second annual William W. Perkins WWII Memorial Weekend. The event raises funds for the Jackson and Reserve veterans’ homes. On Saturday April 12, gates open at Sidney Hutchinson Park in Walker at 9 a.m. and the opening ceremony is at 10 a.m. Military vehicles from WWII through the present and Axis and Allied encampments will be on display throughout the weekend. An Allied and Axis skirmish is at 11:20 a.m. Firing demonstrations of Axis and Allied weapons are at 12:30 and 1 p.m. A tank firing is at 2 p.m. Music performances are at 10 a.m. and 12 noon. Food and merchandise will be available. Several military museums will have displays including the Camp Van Dorn WWII Museum, the GI Museum and the USS Kidd Memorial Museum, and there will be an area where patrons can meet WWII veterans. Sponsor Chick-fil-a will have activities for children throughout the day. The day will end with a battle reenactment of German and American reenactors at 3 p.m. Saturday night the Old South Jamboree will be transformed into the Hollywood Canteen for a 1940’s style USO show. The Spotlight Theater Players will recreate the performances of some of the popular entertainers of the period such as Ella Fitzgerald and Frances Langford. Rosie and The Swingin’ Riveters will provide the musical entertainment. The doors open at 6 p.m. and the show begins at 7 p.m. Tickets are $10 at the door. The Old South Jamboree is at 9554 Florida Blvd. Walker. On Sunday April 13, park gates open at 9 a.m. and activities begin with a military church service at 10 a.m. Firing demonstrations are at 11:30a.m., 12 noon and tank at 12:30 p.m. The battle reenactment at 1 p.m. ends the weekend events. For more info visit www.ww2memorialweekend.com or call 225-315-3776. “The men were allowed to name their tanks, but the names had to start with the letter of their company. We were E company, and our tank was Excalibur. “We had Sherman tanks; they were faster and more maneuverable than the German Tiger and other German tanks. The Sherman could move quickly and get out of the Germans’ firing range or surround them, as we wound up doing just about every time in combat with them. They couldn’t cope with that because they were slow. As a corps or division, we would outflank them on both sides, and I would go with the third platoon right towards the Tigers. They would stay there a little bit until they would see they were being surrounded and then try to maneuver and turn around and head back, and when they did that, we’d fire our 76s and and 75s (75 and 76 mm tank-mounted guns) and set their engine compartments on fire. “A lot of our destruction of the Tigers and the German army period was outflanking them because we had more vehicles and we had another really good thing: our logistics people were so good that when we’d lose a tank, within about 35 minutes we’d have another tank sent up to replace it. The Germanys couldn’t do that. “Every so often tanks have to be refurbished – engines, guns, everything. It takes about five days, and that’s the only time we had off while in Europe. “As we were pushing through France we were liberating towns as we went. Many towns we went through, more buildings were demolished than were still standing. When he got into some towns, there were German soldiers waving white flags of surrender. We didn’t know if they were for real surrendering or if they were snipers. At first we took them for real, but after snipers started getting some our guys – I lost a platoon leader who got shot in the back of the head – we had to go ahead and shoot for self-preservation. People in the town were clapping and waving, and women and children would come running right up to our tanks, and writing their names on the tanks with chalk. It was a marvelous felling, like you had really accomplished something. supply system and bridges that were built in mere days kept the tanks and other vehicles moving and on relentless attack against the Germans. “One unexpected trouble we had was in France where we were driving through apple orchards with low branches that hit and demolished some of our machine guns mounted on our tanks. One man was killed when a gun was hit and swung around and hit him in the head, so we took the guns off and stored them – and we ended up just leaving them off. “At one point in the war, the Army put an air force liaison officer in one of our tanks. Many a time we got stopped by the Germans, and many a time I called him in his tank, and he would call in a flight of P47s, P38s or P51s fighter planes. Those planes were at his beck and call, and I mean when he called, they came right in and bombed (the Germans) right in front of us. That was a God-send, and we had their air support throughout the war. “We had the problem, though, of some of our air force dropping bombs on our own tanks. They came up with bright yellow and orange panels to put on the tanks’ engine compartments so the bombers knew who we were, and that stopped that. After a while we didn’t need the panels because they were so cognizant of what tanks were ours. “I was real tickled at our Air Force liaison man; he managed to find a chicken somewhere just about every day, and he would tie it on the outside of his tank, and every night he would have chicken to eat. You can imagine how funny that looked, rolling into combat with that chicken flopping on the tank! “There were two large battles, and we were in both, one lasted 18 days and nights, and one 13 days and nights of constant battle and no sleeping, just slugging it out and outmaneuvering them. We finally won both of the battles and captured thousands of their troops and liberated the town. “That victory busted open some of the main roads and it finally sent us on our way to meet up with Patton and close the trap around the Germans in the Battle of the Bulge. How do you get to know a person you never met? Not just any person, but your own grandfather. I started with the material I had on-hand, a “History of the Second United States Armored Division 1940 to 1946.” It told the story of the 2nd Armored Division from its formation and training through every landing and battle in World War II to the final occupation of Germany. This was a treasure trove of information, detailing battle group movements and listing the organic make-up of each battle group. This helped provide me with perspective and context of where my grandfather served in World War II, the timing of his movements and the opposition he faced. Tucked in the back of the book, I found additional pieces of memorabilia. First, I unfolded a campaign map of the 2nd Armored Division. The map is in full color, 48×24 inches, and it lists movements of the 2nd Armored Division and its battle groups through World War II with notes about specific battles. I felt like I had uncovered the Jubilee diamond. The map was in near perfect condition except for a few crease marks, lists all of the organic units of the 2nd AD, the Division commanders and enemy faced. I poured over that map like it led to Blackbeard’s treasure, devouring every little shred of information the map provided to me. The second piece of memorabilia was a Christmas card from the 2nd Armored Division. As I opened the card, I saw it had my grandfather’s signature, “Bud,” on the bottom, with a “’44” next to it. Goosebumps covered my arms as I realized that he had to have sent this card home from the front lines of the Battle of the Bulge. My next step was having my mother write to the National Archives requesting his service records. I was waiting with guarded optimism for the records, since the St. Louis Archives had a massive fire in 1973, in which almost all of the records of US Army personnel discharged between 1912 and 1969 were destroyed. I wasn’t sure what I was going to learn or find in these records, but it would at least give me more specifics of where and when he served. If the records were still archived, I would know what regiment and company he served with, what ranks he attained and any commendations awarded. With that information, I would be able to coordinate my general knowledge of troop movements with his actual movements. My mom received a manila envelope in the mail from the Archives and called me. I opened it like a 10-year-old opening Christmas presents. Pouring over all of the old data led me to some surprising finds. Bud Eichman served in Company A of the 41st Armored Infantry Regiment, one of the original organic units of the 2nd Armored Division. The armored infantry traveled by way of halftrack, and the “Fighting 41st” were among the troops that saw the most action during World War II. He qualified “Expert” with the M1 Carbine, so I assumed that was what he carried in battle and trained with at Ft. Knox and Ft. Benning before leaving to participate in Operation Torch. As a sergeant and squad leader, he shipped out in 1942 on a ship bound for Morocco and participated in the first amphibious landings in the Mediterranean Theater of Operation. Among the first US troops to see battle in World War II, Sgt. Eichman landed at Fedala on November 8, 1942, with the Western Task Force under the command of Maj. Gen. George S. Patton, Jr. The landing at Fedala faced stiff enemy resistance, but the Americans fought forward to Casablanca, gaining its surrender. From North Africa, it was on to Sicily to participate in his second amphibious landing, Operation Husky. On July 10, 1943, at 1800 hours, he landed at Gela. During his time in Sicily, he also participated in Patton’s race to Palermo. Taking Palermo resulted in him having to play a role in governmental/policing actions, as the Allied Military Government had not kept up with the rapid advance to Palermo. After capturing Palmermo, the troops were off to England and Tidworth Barracks to prepare for the invasion of Europe. Two amphibious landings, under fire, slogging through the hills of Sicily facing the famed Herman Göring Division, racing against Monty to capture Palermo and finally heading to England to rest, train and re-supply before facing his greatest test. In the midst of all that he was awarded two Bronze Stars and I can’t even begin to explain the admiration I had for the man. It made me immensely proud to know that my grandfather served his country with honor, but that was just the beginning. By June 12th, 1944 the division landed at Omaha Beach as the first armored division ashore on French soil. My grandfather was in Combat Command B of the 2nd Armored Division, put into the line in an area known as the “International Hot Spot,” because of its location between the American and British Army groups. It was here that a German attack to try and split the Allies was feared, but the troops of the 41st AIR held their ground without giving an inch. Operation Cobra, the breakout from the Cotentin peninsula, was the next major engagement for my grandfather. This operation would allow the tankers to get out of the bocage country of Normandy into the more friendly terrain of Brittany. Grandpa’s company was positioned to encircle the German troops and prevent any escape from the Falaise Pocket. Around 12:15, in the early, early morning of July 30, 1944, the men from the 41st AIRe were dug-in on a ridge above the road between St. Denis le Gast and Cambry. The sound of mechanized vehicles stirred the men to action, and when the forms of German soldiers could be seen, they opened fire. Two columns, one of German infantry and one of German armor, were taken under fire just after midnight. Outnumbered almost five-to-one, hand-to-hand combat ensued, in pitch-black conditions, as the men from Combat Command B struggled to hold off the German advance. Our men used friendly vehicles as islands of defense, and as the numbers swelled against them, they leapfrogged from one friendly vehicle to the next. By dawn, they had broken the enemy attack and took tally of the action. More than 100 German vehicles were destroyed, more than 450 enemy soldiers lay dead and more than 1,000 prisoners were taken. The book from Mark Bando, “Breakout At Normandy, The 2nd Armored Division in the Land of the Dead” and “Hell on Wheels, The 2nd Armored Division” by Donald Houston were extremely helpful in developing my understanding of what my grandfather witnessed and fought through. In fact, it was in Bando’s book that I found a member of his A company was awarded the Medal of Honor during the same engagement as grandpa was awarded one of his Bronze Stars. To this day, I yearn for first-hand accounts, someone who served with him who could tell me personal stories, but I was not and am not going to be deterred in historical research by the lack of personal accounts. I form my own memories based on historical documentation, piecing together historical accounts with military records and a few letters home that he sent. As a squad leader, he led his men through Northern France, Holland, Belgium and Germany, breaching the Siegfried Line and attacking the Roer River. The tank battle of Roer River was said to be the “largest of the Western Front; the most decisive action” by German radio. This may also have been the first time that US troops battled against the German King Tiger tank. The victory at the Roer was against the crack German 9th Panzer Division and the 15th Panzer Grenadiers. This action was the final major battle for the Division before the Battle of the Bulge. It was also during this time that I found he had been promoted to Master Sergeant, with his duties being that of Company A 1st Sergeant. What is often lost in the recounts of the Battle of the Bulge are the battles that raged on the northern flank (perhaps because the northern flank was under the control of British Field Marshall Montgomery). It was here that the Germans made their greatest penetration during the Battle of the Bulge, with the goal of securing bridges over the Meuse River and attacking Antwerp, dividing the American and British Armies. On December 21, 1944, the Germans were only 3 miles from their goal of the bridges. It was in the area of Celles, Belgium that the 2nd Armored Division blunted the German salient. Starting at 11 p.m., on December 21st, in blackout conditions, with fog, snow, ice and mud making driving conditions hazardous at best, the 2nd Armored Division moved 3,000 vehicles more than 100 miles in a race to protect the bridges over the Meuse. This remarkable forced march allowed the division to crush the German 2nd Panzer Division on Christmas Day in and around the city of Celles, Belgium. American Corps headquarters issued a statement after the battle saying “The attack of the Second Armored Division may well be remembered a saving one of the far-reaching effects of any action of World War II…” The sheer thought of what these troops endured, I know from a letter I had found that my grandpa stated he had been on the front lines for more than 90 days straight during this time, is truly remarkable. The perseverance, fortitude and the ability to carry out orders in the finest fashion under the worst possible conditions further cemented my belief as to what kind of man my grandpa Bud was. I don’t know if I could feel any more proud of him and honored to be his grandson. Never wounded, five Bronze Stars, continuous combat, horrific conditions, four years without seeing the USA…whenever I think I have it bad, I just think of this man and realize I have nothing in front of me that can’t be overcome. He may never have had the opportunity to set me on his knee and impart his sense of duty and honor to me, but I feel it every day.